New Zealand is situated in the South Pacific Ocean (Te Moana Nui a Kiwa), some 2000 km east of Australia in temperate latitudes, and lies close to the 180° meridian, extending from the 162nd degree of east longitude and 173rd degree of west longitude, and between the 33rd and 53rd parallels of south latitude. New Zealand consists of Te Ika-a-Māui (the North Island, comprising 115,000 sq. km), Te Waipounamu (the South Island, comprising 151,000 sq. km) and a number of smaller islands. Te Ika-a-Māui and Te Waipounamu lie across the boundary of the Pacific and Australian tectonic plates. To the north east, the Pacific plate is subducted under the Australian Plate. To the south-west the Australian plate is subducted under the Pacific plate. Motion of about 40 to 55 mm per year occurs on the boundary through New Zealand. Te Ika-a-Māui has a number of large volcanoes and highly active thermal areas. Te Waipounamu is dominated by the Southern Alps/Kā Tiritiri o te Moana, with Aoraki/Mount Cook being the highest peak (3724m). These mountains form a spine of peaks running almost the length of the South Island, featuring also the Alpine fault. New Zealand has a population of 4.8 million. Approximately 86% of the population lives in cities. New Zealanders mainly identify with European (74%), Māori (15%), Asian (12%) and Pacific (7%) ethnicities. New Zealand has three official languages: English, Māori and New Zealand Sign Language. English is most widely spoken, although the Māori language is currently experiencing a revival. New Zealand was first discovered and settled by Polynesian people, some time between 950 AD and 1130 AD. Polynesians were renowned for their ability to navigate the vast expanses of the Pacific Ocean. In 1642, the Dutch explorer Abel Tasman became the first European to discover New Zealand. Abel Tasman briefly sailed in New Zealand waters before sailing north to Tonga. In 1769, Captain James Cook circumnavigated the country and became the first European to set foot in New Zealand, proclaiming it for the British Crown. After this time, settlement gradually increased. Early settlers included sealers, whalers, traders and missionaries. In 1840 the British Government entered into the Treaty of Waitangi with over 500 Māori chiefs of New Zealand. The English version of the Treaty provides that the Māori chiefs ceded sovereignty of New Zealand to Britain. New Zealand became a British dominion in 1907 and is currently a member of the Commonwealth of Nations. New Zealand has a Westminster style parliamentary democracy, with one chamber of parliament. New Zealand is also a constitutional monarchy, with Queen Elizabeth II as the head of state. Parliament consists of the House of Representatives and the Governor-General, who serves as the Queen’s representative in New Zealand and acts on the advice of the Government. The House of Representatives comprises 120 representatives who are elected under a mixed-member proportional (MMP) electoral system and serve for terms of three years. There are 71 electorates, including 7 Maori electorates. The remaining 49 representatives are elected from political parties based on the percentage of the vote that each party receives. New Zealand does not have a formal written constitution, but legislation, legal judgments and constitutional conventions collectively contain the main elements of a constitution. The New Zealand legal system is based on English common law, with special land legislation and land courts for Maori people. Local Government consists of 78 local authorities including cities, districts, regions and several unitary authorities. Prior to European colonisation, Maori people held land in customary tenure based on communal tribal ownership. Boundaries were generally demarcated by prominent geographical features, and there was no form of written record. Early land surveys were conducted from 1840 onwards to define lands to be acquired from Māori by the Crown; and to set out new towns, roads and land parcels for settlement. A deeds registration system was established in 1842, and the Native Land court was established in 1865 to investigate title to Maori land. The Native Land Court created a system for recording title to Māori land that differed from the deeds registration system. In 1870 a Torrens system of title registration was introduced to replace the deeds registration system, and in the mid 1870s a national land survey system was established. Most Crown and Maori land was surveyed and transferred into the Torrens system as settlement progressed. The need for a geodetic control system was also identified in the mid 1870s, but progress with this was limited and severely constrained by resources and the rugged, mountainous terrain. A national geodetic control system and datum was eventually introduced in 1949. By 1951, compulsory registration of land under the Torrens title system was largely complete, with a small amount of land remaining in the deeds registration system. The survey and land title systems were historically administered in 12 separate Land Districts, operating under central direction and common legislation. In 2002, district offices were disestablished and the survey and title systems became nationally administered. The cadastral and land title systems are administered by Land Information New Zealand (LINZ). The Surveyor-General is a statutory officer responsible for regulation of the cadastral system, survey control system, and associated databases. The Registrar-General of Land is a statutory officer responsible for regulation of the title system, including the remaining land in the deeds registration system. The Cadastral Surveyors Licensing Board (CSLB) is responsible for licensing land surveyors under the Cadastral Survey Act 2002. The CSLB is appointed by the Government and is the successor to the New Zealand Survey Board, which was first established in 1901. Almost all surveyors in New Zealand work in the private sector. Surveys are often undertaken as part of land development projects and subdivisions. Geodetic survey work is carried out by private sector companies under contract to the Surveyor-General. There are two professional organisations for surveyors in the New Zealand. The New Zealand Institute of Surveyors (recently renamed Survey and Spatial New Zealand, S+SNZ) was established in 1888 and represents the majority of surveyors. S+SNZ has 16 regional branches, four divisions and six professional streams. S+SNZ has an approximate membership of 1350. The Institute of Cadastral Surveying (ICS) was established in 2001 and focusses on cadastral surveying. ICS has an approximate membership of 50. The Cadastral Survey Act 2002 provides for the licensing of cadastral surveyors. To become licensed, an applicant must hold a relevant tertiary qualification in surveying and at least two years of post-graduate experience. Applicants must demonstrate competency and pass cadastral law and professional entrance examinations. Cadastral survey licenses must be renewed each year, and renewal requires demonstration of ongoing competency. A four-year bachelor’s degree in surveying is offered at the University of Otago. The degree includes courses in land surveying, planning, urban design, civil engineering and spatial information systems. Approximately 50 students graduate each year. A two-year diploma in surveying is offered at Unitec. The diploma includes courses in land surveying, geodetic surveying, engineering surveying, and land administration. The main purpose of the cadastral system is to support registration of land. However, the cadastral system also supports land valuation and rating systems and is used extensively for government administration, land planning and utility management. It forms a fundamental layer in a number of GIS systems. Combined with street addressing it is used for definition of electoral boundaries and for emergency services. Other cadastral systems are maintained by different agencies to record more discrete rights and responsibilities, such as mining rights and concessions to carry out activities over land. These cadastral systems generally use the principal system for base data. LINZ is responsible for administration of the land title system, the deeds registration system and parts of the State land system. The Maori land system is administered by the Maori Land Court. The principal cadastral unit is a surveyed and monumented parcel, with an appellation and an area. Parcels are also created for other interests such as leases and easements. The principal ownership unit is the fee simple title. Titles are issued in terms of parcels defined in the survey system, and may be issued for one or more parcels. Properties differ from parcels and titles. The term "property" is used by central government and local authorities for administration and taxation purposes. A property usually has one street address and one residence, and typically relates to one land title. Like titles, properties may comprise one or more parcels. · Parcels are defined by survey and monuments, and documented on survey plans (cadastral survey datasets). Parcels are usually described by lot or section number and plan number. · Boundaries may be defined by monuments (pegs) placed in the ground, natural features such as river banks, or man-made features such as fences. · The land transfer register records ownership of land parcels, and other interests such as mortgages, caveats, leases and easements. · The Maori Land Court register records ownership of Maori land parcels and other information such as interests and trustees. · The State land system does not have a formal register. Crown agencies and local authorities typically maintain records of the land that they own or administer. Some state land such as national parks, reserves, and public works land may be registered under the land transfer system. Unalienated Crown land is effectively held under a quasi deeds registration system. The cadastral survey and land transfer systems are now computerised. LINZ’s Landonline system provides for electronic lodgement of survey plans (cadastral survey datasets), electronic lodgement of title transactions, and automated processing of titles transactions. Most survey and title data is now held digitally and can be accessed through Landonline. New Zealand has complete cadastral map coverage. Prior to the mid 1980s, each Land District maintained hardcopy cadastral record maps. The cadastral record maps were created at a variety of scales ranging from 1:400 to 1:50:000. In the mid 1980s, a national digital cadastral database (DCDB) was built by digitising parcel boundaries from the existing cadastral record maps. 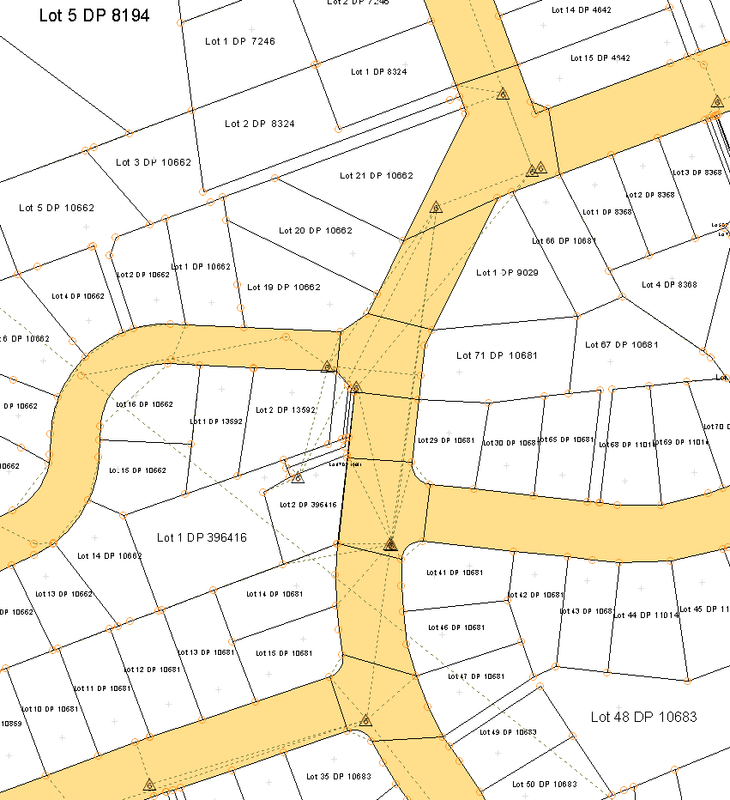 The DCDB had full topology and recorded relevant information such as appellations, areas and survey plan references. In 2000, a survey conversion project was undertaken to support the implementation of Landonline. The project replaced DCDB data with survey-accurate digital data for 70% of the parcels in New Zealand. The survey data for some 1.4 million parcels was back-captured from existing survey plans, connected to the survey control network in terms of the new geodetic datum, NZGD2000. Boundary co-ordinates and indicators (error ellipse) of accuracy. Example from Landonline with several of the 120 possible layers turned on. The Landonline cadastral database is used extensively for a number of central government, local government and commercial applications. Central government agencies use the cadastral data in GIS systems to manage property, grant interests such as mining permits, and undertake statistical analysis. Local government agencies use the cadastral data in GIS systems for resource management purposes. Cadastral data is made publicly available through the LINZ Data Service, enabling commercial users to access the data for a number of purposes. The Landonline system is approximately 16 years old. LINZ has begun the process of replacing Landonline with a modernised, enhanced system which will be easier to upgrade and provide an enhanced customer experience. Development of the replacement system is expected to take several years, and Landonline will remain in operation in the meantime. There is increasing public demand for strata interests in land - from reasonably simple apartments with upper and lower height limits, to complex developments involving a mixture of interests such as roads and railways on different inclined planes. Landonline can only display these interests in 2D and survey datasets have to rely on elevation views to portray the situation. LINZ is considering the development of a 3D cadastre as part of the project to replace Landonline. New Zealand law was originally inherited from England and is not always a comfortable fit for New Zealand’s conditions. This is particularly so for New Zealand’s often meandering rivers and streams, where some margins regularly change position. The manner in which movement occurs dictates ownership of former riverbed, but it can be difficult to establish this and there is often a lack of clarity around the ownership of former riverbed. The cadastre reflects the last surveyed positions of the water margins, which often bear no resemblance to the current positions. Consequently the cadastre is of no use in clarifying the extent of usable land adjoining water bodies, or its ownership. The first two initiatives are expected to be developed within the next five years. The last issue is not primarilly a survey issue and may take longer to resolve.